Don’t let April showers bring May water damage. Some DIY gutter maintenance this weekend can protect your roof, your home, and your landscaping from damaging spring rains. Clean your gutters to remove leaves and debris that can clog up downspouts and cause water to overflow and damage your home. Check for leaks and loose support hangers, and make sure the gutters are sloped properly – they should decline at least ¼-inch every 10 feet. Trim any tree branches that hang within 10 feet of your roof to stop falling leaves from landing in your gutters. 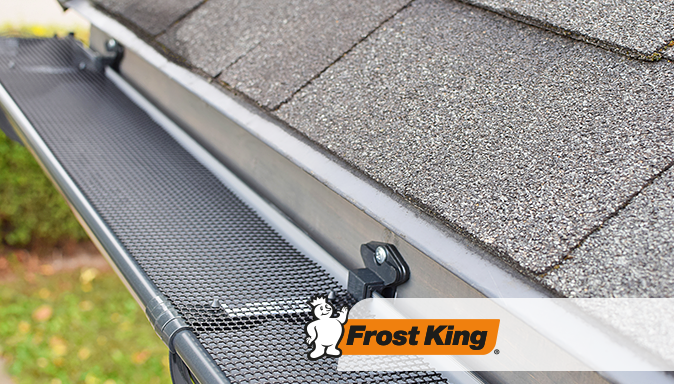 Prevent future leaves and debris from clogging your newly clean gutters and downspouts by installing Frost King’s Vinyl Snap-in Gutter Screens and Plastic Downspout Guards.